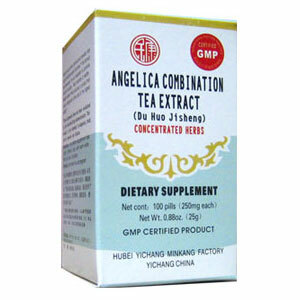 Applicable for chronic lumbago, sciatica, arthritis and rheumatism. Pain and coldness in the lumbar area or legs or joints (especially knee joints); tremor may be present (due to Deficient blood); joint stiffness and numbness. This is a commonly used medicine in China for Bi syndrome, especially for cases with Deficient Qi and Deficient Blood. In TCM theory, Bi syndrome is a combination of Wind, Cold and Dampness. When these three factors affect the tendons and bones over a long period of time, the Liver (tendons) and Kidney (bones) are also affected. This will thus lead to the development of Deficient Blood and Deficient Qi. This formula will help prevent progression of the Bi syndrome into weakening the liver and kidney. It will strengthen the liver and kidney to reinforce the tendons and bones. Thus the ingredients in this formula will treat both the symptoms associated with Bi syndrome as well as the root cause. This formula for lower back pain addresses deficiency of kidney Qi and liver blood complicated by pathogenic wind and damp. It is applicable for arthritic conditions when weak lower back and weak aching knees are predominant. It is often taken by older patients for arthritis and rheumatism, and is safe to use for long periods of time. Eliminate Wind-Dampness, stop pain, nourish blood and Qi, strengthen liver and kidney. Tonifies blood, strengthens tendon and bone.